The folks over at DesignBuildBLUFF are doing some gooood things, y'all. We've touched on all the good that they do before, but for those just tuning in, we'll hit you with a little recap: DesignBuildBLUFF is a wicked-cool program that allows graduate architecture students at the University of Utah the opportunity to design [and build] inventive architectural works, simultaneously providing hands-on experience for the students and housing for members of the Navajo community in Bluff, UT [design/build/Bluff--get it?]. With an emphasis on sustainability [always a win] and a "respect for the unique social, cultural, and environmental needs of the region", the people of DBB are blazing trails of triumph and innovation in all directions, and this year's project is shaping up to be one for the trophy case. 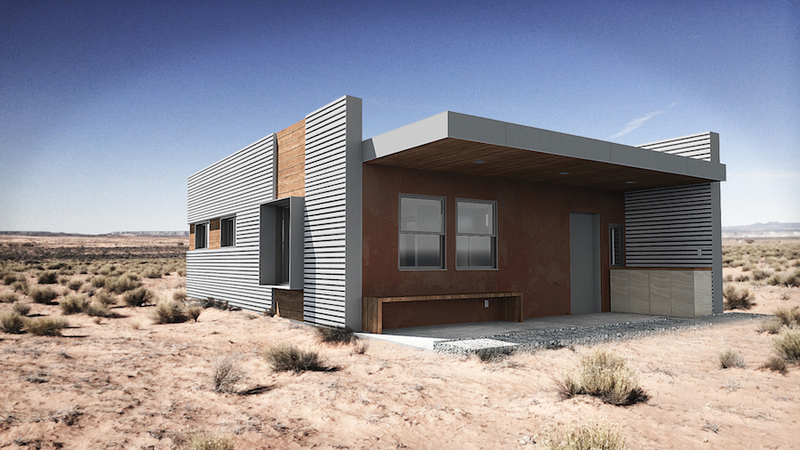 The students have been tasked with designing and building a dwelling for a Navajo family of three that will withstand the aggressive desert climate of southern Utah [think: sandstorms, windstorms, harsh sunlight, and even monsoons]. In order to help this family--which is currently living in a one-room home with no running water or electricity--DBB needs your help [our help…everyone's help]. The group is currently raising funds to help them complete the already-in-progress home they're building this year [see the pretty stunning rendering below, or peep the process on their blog]. It's DesignBuildBluff's vision to "give chance a place to incubate", and we think that's a pretty astute cause. Think big and dig deep...you don't have to give a lot to give a lot, you feel us? It takes a village, folks--let's get givin'. Donate any amount to DesignBuildBLUFF's architectural undertaking at GoFundMe or Razoo.